Welcome to my 48th blog post! Let me get straight to the point in this one. It seems unfortunate that e-cigarettes are all the rave at the moment. It's frustrating for me to see people puffing away on these things, knowing for a fact that it doesn't have to be that way....if they only knew that hypnosis is by far the most easy and effective method to quit smoking. In this blog I will give 5 reasons why this is the case. 1. At least part of the reason why people continue to smoke is 'Nicotine'. Yes, it is very addictive ~ but the good news is that nicotine leaves the body relatively quickly (Less than 3 weeks) and after that it really is all in the mind. Alan Carrs excellent book 'The easy way to stop smoking'1 explains this very well ~ he calls it the 'nicotine trick', meaning once you put out that last cigarette the nicotine level in your body drops, which triggers a message to the brain to put in more nicotine, which results in that feeling of a 'craving'. So you light up the next cigarette to feed to monster and it then becomes a never ending cycle. In the less than three weeks it takes for nicotine to leave the body, hypnosis can make that process very easy if instructions are followed. Why: Because the part that makes you smoke is removed (see reason 4) and suggestions are given not to have cravings. By using a 'substitute' such as an e-cig or nicotine patches, all you are really doing is swapping one bad habit for another and you still have the nicotine, which is actually part of the problem. I don't see the point in using 'more of the problem to solve the problem'. Truth: You might remember living up to your teenage years or longer without the need for nicotine? You don't need it in any form. The fact is it is a poison to the human body. 2. Hypnosis encourages you to exert personal responsibility over the choices that you are making. 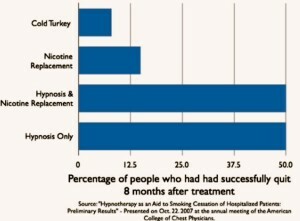 All hypnosis is 'self hypnosis' and my stop smoking clients really do all the work themselves (I really just 'facilitate the process'). By stopping using the power of your own mind, comes a great sense of achievement, accomplishment and pride much greater than can ever be achieved by a puffing away on an e-cigarette. Truth: You do not need any crutches, you can do this yourself and be free. 3. Hypnosis will empower you with 'self belief' and 'confidence'. We all have far more potential than we would ever realize, but sometimes that power is lying dormant within us. Hypnosis will allow you to reignite that fire within and awake your true power, which is the nemesis of the smoking habit which of course dis-empowers you. Truth: You CAN stop smoking easily if you put your mind to it! Just commit to the hypnotic process and follow all instructions. 4. Neurologically speaking, we are all programmed at an automatic subconscious level, the manifestation of which are habits and behaviors. Hypnosis by-passes the critical factor of your conscious mind (which holds limitations in place, i.e. the 'i can't mentality') and accesses the powerful subconscious, to remove the program (or programs) that are making you smoke. So it literally is 'good riddance to bad rubbish'! Truth: This is the exact reason why after my hypnosis stop smoking program many people report that: "It's like I never smoked in the first place". You owe it to yourself to stop smoking. There are no advantages to it and you are only leaving behind a disgusting habit. Cigarettes have now gone up to 12 euros a pack in the most recent budget. But more importantly you cannot put a price on your health! There will never be a better moment than now to stop smoking. Make that first step and call me now on 086 8211677. 1. Carr, Allan; 'The Easy Way To Stop Smoking'; Revised Edition, 2015. Penguin Books. I have read your post this is really nice and helpful, thanks for sharing such useful post. Here, I would like to add one of the specialized hypnotherapy Dallas the "Mind Enhancement Center" having expertise with more than three decades.